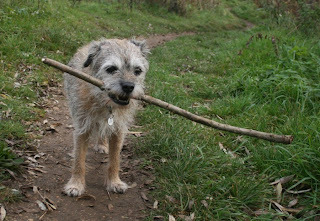 Harry will often carry a stick in a rather uneven way - perhaps because it is easier to pick up near the end. Then after a while, unaccountably, he will drop the stick and forget about it. He has carried hundreds, possibly thousands, of sticks, and there is often a little collection outside our front door - sticks of all shapes and sizes. Well it's obvious, isn't it. He's doing his bit to Keep the Home Fires Burning.